It’s not been picked up by the pundits or the betting markets but ALL four of the main opinion polls have shown Tory gains in August. With the UKIP effect continuing to unwind there is the potenial for further improvements but all this is being ignored by the betting markets. Remember it was the UKIP surge ahead of the June 10 Euro election that caused Michael Howard to falter. Take this away & the Tories might be heading towards their pre-spring position of 38- 40% in the only anonymous interviewer-free poll that we have at the moment, YouGov. the computer-generated phone polls of Rasmussen last time and YouGov’s internet operation. When tested in real elections non-anonymous interviewer-based polls almost always understate the Tories and overstate Labour. This happened at the last 3 General Elections and in the June 10 Euro elections. The conventional pollsters say their advanced techniques are now dealing with this better. But two of them in the figures above have boosted the Labour totals to compensate for those reluctant to tell interviewers their allegiance. We understand the mathematics but question the basis on which this is being done. Only time will tell whether they are right. 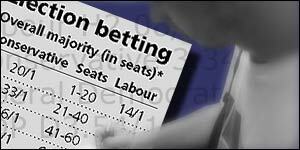 A LAB BUY spread bet at 351 seats is as safe as one on Paula Racliffe being re-elected BBC Sports Personality of the Year. The betting exchange, Betfair, have now opened a market on the Hartlepool by-election. So far there are very few backers and layers but Labour is just favourite over the LDs. Labour are 1/2 while the LD current price is 2/3. This could change quickly. If I was sitting in front of my computer rather than composing this on my smartphone sitting on a French beach I would be trying to lay Labour at 1/2. There are only 2 parties in it and they are closer than the price suggests. Although UKIP came 2nd to Labour there in the Euro Elections the LDs came a strong 2nd in the local council poll held at exactly the same time with the same voters. If Kilroy-Silk had been candidate UKIP might have had a chance. As it stands the UKIP bubble looks as though will burst in Hartlepool giving some relief to Michael Howard. The convenional bookmaker, William Hill told us 10 days ago that thiey won’t be opening a market on the “Monkey-town” by-election unti the date is fixed and all the candidates are known. This is a pity because there’s a lot of interest. Today’s YouGov poll has CON 34%(+1), LAB 34%(nc), LD 21%(-2), Oth 11%(nc). UKIP is at 6% compared with 4% with MORI and 1% with ICM. They cannot all be right but a sixfold difference must be a record. MORI’s new poll has: CON 32%, LAB 36%, LD 21%. Labour are up 4%. the Tories are up 1%, as UKIP fall one point to 4. At this stage before the last election MORI was showing a 22% Labour lead with the LDs on 15%. Labour were on 51%. YouGov should be out tomorrow and UKIP’s rating will be interesting.! After 94 comments can the thread be continued here? In this last article before my holiday I thought I would set out my personal General Election bets. These are mostly in line with the calls that we’ve made on the site. Some now look silly, some look really good value and some look over-priced – but they all seemed a good idea at the time of being made. They also reflect how attitudes to political outcomes have changed over the past year. Labour to win most seats at 2/5 at the next GE. This is a banker but, alas, the price means no rich pickings and it’s nearly halved to about 1/4 since June – but this is a better return than the building society. Could it be almost as safe – judging by his actions Tony Blair seems to think so!Prices. Lib Dem spread BUY bets at 58 and 60 seats which should give me a really big pay-out – the more seats above the bigger the winnings though with this form of betting it works the other way round if you’ve called it wrong. But the markets has moved so much that these bets could be closed down today and there’d still be a big profit. I’m staying in for my jackpot! Prices. Sell spread bet on number of Labour seats. This will be the big GE bet and I’ve been waiting for the sell price to reach 350 seats before going in but now think that I missed my chance at 346 four weeks ago. I’ll bet when I think the price is best for maximum profit and minimal risk. Labour start with a notional 403 seats so the current sell price envisages 61 losses. Prices. The Lib Dems to win most seats at the GE which thanks to a free bet for opening an account with the Blue Square is at effective odds of 132/1. Probably the most certain loser on the list but, heck, everybody has dreams and given the electorate has now fallen out of love with Labour as well as the Tories then anything could happen – but don’t put your shirt on it! Prices. Labour to get less than 336 seats at 2/1 combined with the Tories getting less than 221 seats at 7/4. Unless there’s a big collapse of LD and Nationalist seats at least one of these bets is almost certain to come in and most likely both of them will. What’s elegant is that if Labour gets more than the stated level then the Tories are almost bound to get less – and vice versa. Whichever way you should win. As soon as I mentioned this on the site the bookmaker changed the odds to make it not worthwhile. Bet365 link. The Tories to get 245 seats or more at 3/1 placed six months ago when YouGov had them at 39-40%. The often repeated claim that YouGov is biased to the Tories doesn’t stand up to scrutiny. The pollster underestimated the party at the ’01 GE, the ’03 Scottish Parliament elections and June’s Euro Elections. The Tories have now slipped 6% and the bet is probably a loser. Bet365 link. An autumn 2004 General Election date at 5/1 placed when the talk was of Blair standing down and a new leader who could go to the country straight away. The alternate scenario was that if Blair stayed it would be a good way for him “to draw a line” under Iraq and its aftermath. This might sill be right and prices have tightened. 100 bets and lays on Betfair “still party leaders” market that was set up while IDS was fighting for his job. On each of the four remaining options – Blair & Kennedy to be still there; just Kennedy; just Blair and “none” I have very substantial winnings to come. This has been a great market to trade in – buying and selling Blair and Kennedy with huge fluctuations whenever either has been under pressure. Prices. Michael Howard to be Tory Leader at the GE – a range of bets from 5/4 to evens all placed on the afternoon of the IDS confidence vote when the David Davies betting exchange price just collapsed and it was obvious a deal had been done to bring Howard in without a contest. That afternoon you could follow precisely what was happening by looking at the live betting exchange prices. Barring an accident this must be a certaintly now. Prices. Jack Straw to be “Labour leader at the General Election” at an average of about 30/1 placed when the talk was of Blair going and I’ve never been convinced that Gordon Brown will be his successor. It still could pay off but realistically Blair is going to stay and the bet is a loser.Prices. And in the US – Democrats to take the White House. After, sadly, winning with a Bush bet in 2000I started backing the Democrats at more than 2/1 on the night of the Iowa caucuses in January. That event seemed to demonstate the determination of the party to put aside faction fighting to focus solely on winning back the White House on November 2. The price has now tightened to less than evens. Prices. All told I think I’ll end up well in the black although I get really hammered on the BUY LD spread bets if they fall far short. 45 LD seats would be a headache – 35 seats a disaster. Next planned article on September 8. Keep the comments coming in – they are the best part of the site and there are enough issues above to start many different threads. The Democratic ticket is holding firm in the polls with a clear lead in most of them after a sustained and well funded attack in an attempt to undermine John Kerry’s status as a Vietnam war hero. Records show that the group received the bulk of its initial financing from two men with ties to the president and his family – one a longtime political associate of Mr. Rove’s, the other a trustee of the foundation for Mr. Bush’s father’s presidential library. A Texas publicist who once helped prepare Mr. Bush’s father for his debate when he was running for vice president provided them with strategic advice. And the group’s television commercial was produced by the same team that made the devastating ad mocking Michael S. Dukakis in an oversized tank helmet when he and Mr. Bush’s father faced off in the 1988 presidential election. A particularly revealing aspect is that several of those veterans featured attacking Kerry had lavished praise on him, some as recently as last year. The issue could well re-bound on George Bush as he prepares for the Republican Convention in New York at the end of the month. The Iowa Electronic Exchange, where “political futures” such as who will win are traded like a stock has seen the Kerry price ahead of Bush a number of time in the past few days. This market is on who wins most votes not who will be the next President so last time the Al Gore backers would have won. The best UK bookmaker prices are 17/20 on both Bush and Kerry. You can get slightly better than evens on Kerry on the Betfair exchange market. We stick with our call, first made in May, that Kerry will win. A President who has been so low in the popularity ratings in an election year has never gone on to win a second term. If you can get better than evens on Kerry take it. Every General Election gambler should hope that the Independent newspaper contracts again with the US polling organisation Rasmussen which at the 2001 General Election was the most consistent pollster and the only firm that got the Tory share right. The firm used the phone to contact people to be surveyed but a computer, not an interviewer, read out the questions. Respondents then typed in a number on the phone keypad to signify their answer. The automated system conducted interviews with whoever answered, and went into the detailed questioning after checking whether they were aged 18+. After corrective weighting to deal with factors such as getting too many women and old people they produced what turned out to be incredibly consistent results. Throughout they had the Tories solidly either on 32% or 33% – the final figure was 32.7%. Their Labour figures, on 44% to 46%, hardly varied and their final call was just 2% out. They did underestimate the Lib Dem share which meant meant they wern’t the most accurate pollster taking all the numbers into account. They had none of the inflated Labour leads that all the other pollsters produced at some point. Alas – not many people knew about the polls because the Rasmussen methodology was deemed as “not approved” by the BBC which banned all reference to the polls on all Corporation outlets. They were strongly attacked by other pollsters and news of the surveys was confined to the smallest national newspaper – the Indpendent. The fact that the Tory and Labour shares stayed so constant throughout the campaign undermines the argument by the main-stream pollsters that there was a “late swing”. To their credit members of the UK opinion polling establishment who had been very sceptical did acknowledge Rasmussen’s success afterwards. The Rasmussen philosophy is based on the main difference between being interviewed by a polling organisation and actually voting is the human interface. For voting is a very private act. You put your X against the candidate of your choice, fold the paper so that the printing is on the inside and then put it through the slot in the ballot box you. You can have no fear of dissapproving looks from those you are close to or even those supervising the election because the ballot has been secret. This has been the big argument in favour of internet polling – the interviewee is dealing with a computer and not a real person so that all those human interface issues do not come into it. But only about half the population is online and this the protagonists say can distort the sample. Let’s hope the Indy uses them again and the BBC bases its selection of “approved polls” on those with a proven record of accuracy. It will be good to have another pollster using a completely different methodology that does not have the human interface factors of the conventional pollsters and avoids the sampling issues of internet polls. Given its extraordinary record last time with the Tory share – and not too bad with Labour, it will be a good cross-check on the others. If today’s 3% ICM poll improvement for the Tories is followed by Mori, YouGov and Populus it might just affect the betting. In recent months ICM has usually been showing bigger leads for Labour than the other firms and this might be due to the weighting it attaches to those surveyed who are not certain to vote. In July all the other pollsters had the two main parties within one percent when ICM had a 5% margin. Today that is down to 3%. We need to focus on this because Labour’s ability to get those who support it actually to vote is likely to determine the General Election. Our view remains that the Conservatives will be hard-pressed to get more than 220 seats. But those who think that Michael Howard’s party might do better should check Bet365’s 5/2 on the Tories getting 245 seats or more . This is by far the best bet on the Tories that there is and would give you winnings of £250 on a £100 bet. Just compare it with the 11/4 they are offering on the party winning outright which would give you winnings of just £25 more. For that the party would need to get at least 50 more seats. We think that Labour will struggle to recover by very much in the polls but if you think otherwise then Bet365’s price of 3/1 on Labour getting 360 seats or over offers better value and less risk than the spread markets. That seat level means the party would have a majority of 72. Bet365 have now dropped their market on whether the Labour majority will be more or less than 51.5 seats. They’ve also sharply tightened the price in the Commons seat market on Labour getting 335 seats or less – a bet we suggested just 10 days ago when it was 2/1. Immediatly after our recommendation it tightened to 11/8 and then, on Monday, it was moved to evens. A November Election – surely not? What are we to make of suggestions that Tony Blair might be conisdering calling an autumn General Election – certainly, the price on this possibility has tightened sharply on the Betfair election date market. The suggested date is November 4 – just two days after the US Presidential election. A recent paper by the Tory economist , Graham Mather, argues that the “economic situation in May is unlikely to be better than in November; interest rates may rise, house prices rises may decline and March may see a difficult budget.” Also he notes that a “Holding an election in 2005 would run into Britain’s G8 presidency in the first half of the year and its European Union presidency in the second half”. But we are not convinced. The long-expected election day of o5/05/05 fits in with the four year cycle and would co-incide with the English County Council election in which Labour is expected to do very badly. Going to the country less than three and a half years after the last election with a massive majority would just lead to opposition charges that Tony Blair was “cutting and running”. 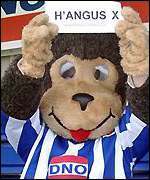 William Hill have told us that they won’t be opening a market on the “Monkey-town” by-election until the date is fixed and all the candidates are known. This is a pity because there’s a lot of interest. If anybody hears of bookmakers taking bets then please let us know. Meanwhile Labour’s decision to replace Tom Watson – the Labour MP who was running his party campaign – is probably the best news that the Lib Dems could have had. His single-mindedness in Hodge Hill over the LD candidate’s job in the mobile phone mast industry allowed him to make this into the issue that saved the seat – just. His campaign style gives activists somthing to believe in and they are absolutely vital in by-elections. This is where UKIP are weak. Winning Euro votes and seats is a totally different form of campaigning than by-elections where what’s at a premium is your on-the-ground campaigning ability to get your message over, identify your supporters and then get them to the polling station. They will be hammered by the Labour and LD machines on the ground. Domestic issues are what count and UKIP simply does not have a proposition as was shown on June 10 when it failed to make an real mark in local elections that were held at the same time.